Fierce Fairytales is right. Gill pulls no punches with her brazen, raw, intelligent retellings (and mashups!) of SOOO many fairy tales, fantasy, myths and even religion. Including, but in no way limited to, Peter Pan, Cinderella, 1001 Nights, Beauty and the Beast, Little Red Riding Hood, Jack and the Beanstalk, Alice in Wonderland, Pandora, 7 Deadly Sins, Hansel and Gretel... there are even a couple nursery rhymes. Gill's overarching theme is one of empowerment: protect yourself; rescue yourself; love yourself; respect yourself; be true to yourself, your voice. Though, I couldn't help but notice these tales border on making a correlation between empowerment and singledom. As if one must forsake partnerships and/or relationships in order to fully embrace Self. (And I say this as someone who has been single by choice for five years.) I finished many of her tales thinking, "Except, loving oneself doesn't mean you have to be alone unless you want and choose to be alone" Like Sleeping Beauty in "Waking Beauty," pages 66-69. There were even times when I said out loud, "You can still have a voice and be a wife, mother, sister, daughter..."
I'd suggest pulling out a collection of traditional fairy tales, reading a Cinderella or a Sleeping Beauty or whichever tale, reading its counterpart in Fierce Fairytales, then having a nice long discussion about the two. In all things balance, I say. Recommended if you like poetry by Rupi Kaur or you want in-your-face feminist fairy-tale retellings and mashups. The illustrations were spot-on. Loved "The Red Wolf" drawing! "Out there may be monsters, my dear. you should always believe in." from "Once Upon a Time II"
"She knows inside her heart the truest love she can find is the love she has kept inside herself all along." from "Waking Beauty"
"A woman without a man must be haunted, or the thing that haunts." from "Belladonna" Origin story of the witch from Hansel and Gretel; falsely accused for what the real monster did. "In Absentia: A Common Curse"
"Absent fathers still raise daughters. They just raise them to be prey. They raise them to obey. I was really upset by this one seeing as I'm a single mom, and I know many single moms who raise strong-willed, independent, well-spoken daughters like mine. 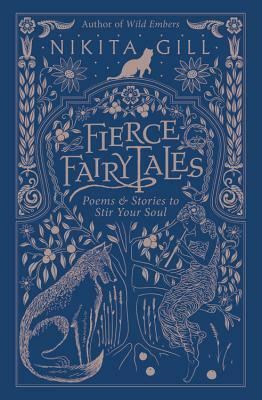 Sign into Goodreads to see if any of your friends have read Fierce Fairytales.